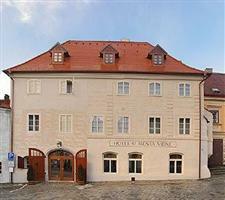 The Hotel Bellevue Cesky Krumlov is located in the UNESCO protected area of the city. Guests will find that attractions such as Krumlov Castle are within walking distance. The hotel is also near the Wax Museum and the Museum of Puppets. The Hotel Bellevue Cesky Krumlov offers travelers a location that is near both the trains and buses. The Linz airport in Austria is 90 kilometers away, while Prague airport is 180 kilometers from this four star hotel. Local attractions are easiest to reach on foot. Each of the guestrooms at the Hotel Bellevue Cesky Krumlov includes complimentary Internet access. Rooms also include satellite television, safes, and dark wood furniture. Every room includes a private bathroom with a robe and a hair dryer. Guests of the Hotel Bellevue Cesky Krumlov will find ample shopping and dining nearby. The hotel offers an onsite restaurant and bar as well as a breakfast room. The hotel also offers a gym, a sauna, a garden, and three conference rooms.